Those deadlines aren't stopping for anyone! Long hours, non-stop emails, countless revisions, endless deadlines—the next thing you know, you missed your lunch break (again) and are now one big ball of stress. No one ever said office life was easy and stress-free, but if you're a frustrated or exhausted wreck from nine to five—and beyond—it's important to remember to step back and take a few moments to yourself. Workplace stress can take a serious toll on your productivity, not to mention your physical and mental health. Address the problem head-on by doing any of these stress busters. Taking a few deep breaths can help reduce tension, loosen those shoulder and neck kinks, and relieve stress. When we breathe deeply, our lungs open up and our minds become clear. Breathing in and out slowly also increases oxygen levels in the brain and slows down the heart rate, allowing you to feel more peaceful. 2. Don't reach for another cup of coffee. Sure, we probably need a little caffeine to get us going in the morning, but downing cups of coffee throughout the day may not be good for you—studies show that caffeine can be a natural anxiety booster. Instead of coffee, try sipping green tea, which has less than half the caffeine of your americano. Green tea also contains theanine, an amino acid that helps calm your nerves. 3. Look at memes or watch funny videos. Several studies show that aromatherapy, or the use of scents or essential oils, is particularly helpful in stressful situations. 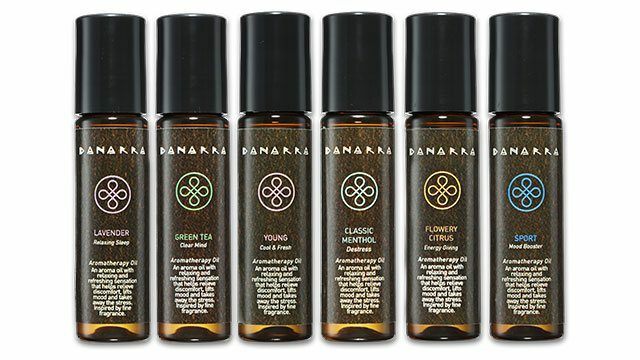 Danarra Roll-on Aromatherapy Oils combine the traditional formulation with fine fragrance oils and use natural cooling ingredients to offer a range of relaxing and refreshing scents that help balance your mood for increasing your productivity. Roll on the Classic Menthol variant on your pulse points to increase your ability to concentrate during stressful times, get a whiff of Flowery Citrus to boost your energy levels, or apply Green Tea onto your temples to clear your mind. Listening to music can do wonders for your soul and stress levels, so slip on your headphones and play your favorite tunes. Slow instrumental music can induce relaxation and reduce cortisol, while upbeat songs can help re-energize your mind. 6. Think to yourself or talk to a friend. Take the time to assess the situation and figure out your next steps, so you can proceed without feeling lost or confused. Talk to a friend if you need to vent or get some advice, since hearing someone else’s perspective is especially helpful when you're bogged down by stress. 7. Take a quick walk. Taking a short turn around the office or a brisk walk around the block helps clear your head and gets your blood flowing, effectively releasing endorphins that can improve your mood almost instantaneously. Simply stretching your back, shoulders, and legs during a break also offers immediate relief in a stressful situation. Danarra Roll-On Aromatherapy Oils are available in Mercury Drug stores nationwide. Follow Danarra on Facebook to find out more about their products. This article was created by Summit Storylabs in partnership with Danarra.